The Gotti Diet is written by a teenage boy, Frank Gotti Agnello, who is a reality television show star on the show ‘Growing up Gotti’. He recruited help from his doctor, lacrosse coach and his mother to write his diet book, which outlines a plan similar to the one that helped Gotti to transform himself from being morbidly obese to a fit and healthy teenager. The Gotti diet does not involve any strict guidelines or meal plans but rather focuses on limiting certain foods such as refined grains and sweets. Gotti was told by his doctor that his morbid obesity was putting him at an increased risk of serious illness. But it was when he discovered that his family was going to be involved in a reality TV show that Gotti decided to make some positive changes to his lifestyle. He didn’t want to be seen as the fat member of the Gotti family. Gotti designed the seven-step plan that is the foundation of his diet book so as to achieve his weight loss goals. Step 1 – Acknowledge that you have a weight problem and get motivated to look and feel better. Step 2 –Enlist support of friends and family. Step 3 –Separate self worth from body image and don’t be too hard on yourself. Step 4 –Keep a food diary. Step 5 –Learn how to make healthier food choices. For example, lower fat substitutions for creamy sauces and dressings. Step 6 –Become more physically active. Step 7 –Add weight training exercise in addition to cardiovascular exercise. Lean meat, poultry, fish, whole grains, whole wheat bread, rice, fruit, vegetables, fruit sorbets. Look here for more recipe ideas. Exercise is an important part of this program with dieters being advised to increase daily movement whenever possible especially in activities that are enjoyable. Gotti emphasizes that school physical activity programs are insufficient and his program provides specific outlines regarding exercise to increase calorie burning. 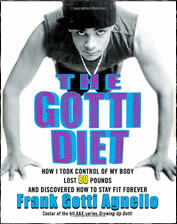 The book also provides photos of Gotti demonstrating weight lifting exercises along with schedules for weight training. These resistance exercises can be used with the Gotti Diet. The Gotti Diet retails for $16.95. Simple and easy to follow. Realistic expectations for long term weight loss. Promotes the use of healthy foods. Acknowledges importance of exercise for a weight loss plan. Encourages skills such as cooking which will support healthier eating habits for life. Emphasizes the importance of the whole family being involved in a healthy lifestyle when a child is overweight. Will mostly appeal to the target audience of teenage boys. May increase risk of nutritional deficiencies by limiting food choices in growing teenagers. Requires some time for food preparation. It is always best to be cautious when recommending diets for teenagers as it is much better to focus on making healthier choices and increasing physical activity rather than dieting as such. This may increase the tendency of a dieting mentality and unnecessary restriction of certain foods at a time in life where a wide range of nutrients are necessary for optimal growth and development. However in general the Gotti diet takes a balanced approach to teenage obesity and the guidelines will teach healthy habits that may be sustained for a lifetime. It is written in a way that other teenagers will especially relate to. This will help to alleviate many of the emotional stresses that are associated with being overweight during this stage of life, while enhancing the ability to discover the motivation required in order to make healthier choices. I admire Frank Gotti Agnello for taking the issue and publicly addressing it with care and concern. I do agree with Mizpah Matus B.Hlth.Sc (Hons) that the growing body needs a wide variety of nutrients and foods from various sources. When eating one must get in touch with the natural innate mechanism of “hunger and full”. I find even while eating your body mat respond ‘full’ of one type of food but still be hungry for other items on the plate.